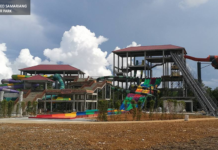 Many probably hasn’t noticed that in bid to lessen waste, tHe Spring Kuching has a small project for the public to recycle and get paid. Perhaps the term ‘Recycle and get paid’ may be too general, but it is the best definition I could come up upon noticing the environmental effort at the ground floor of the shopping mall. 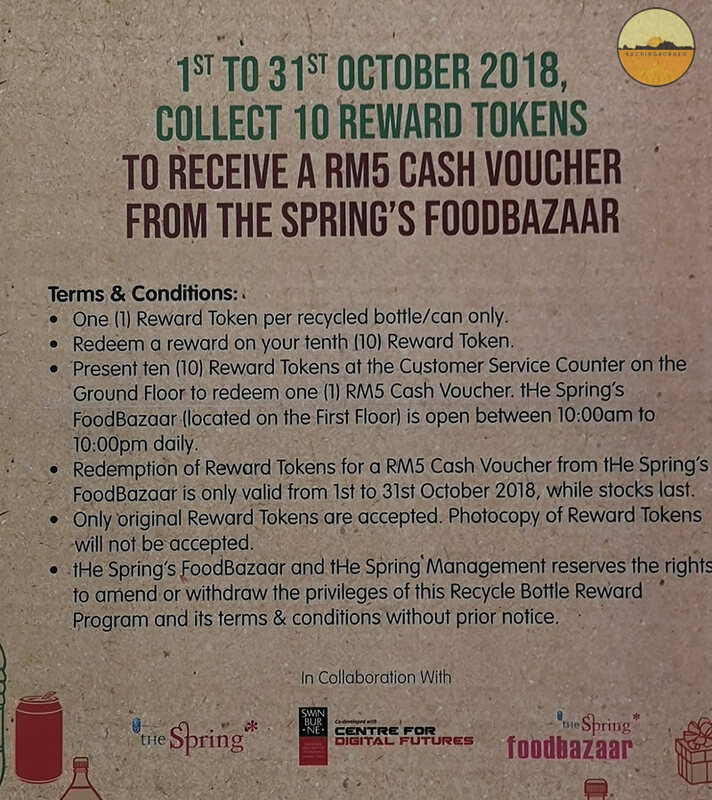 The project offers RM5 cash voucher for use at tHe Spring’s FoodBazaar and you need only 10 tokens to get the RM5 cash voucher for recycling at the mall. HOW DO YOU GET THE TOKENS? It is likely many would not notice a green coloured machine at the underground floor of tHe Spring Mall Kuching. I can’t blame you. The decor that pointed to the machine doesn’t really say “Hey, this is a recyling machine“. It does however look like an over-sized promotional banner, and the machine looks like your typical water drinking vending machine. 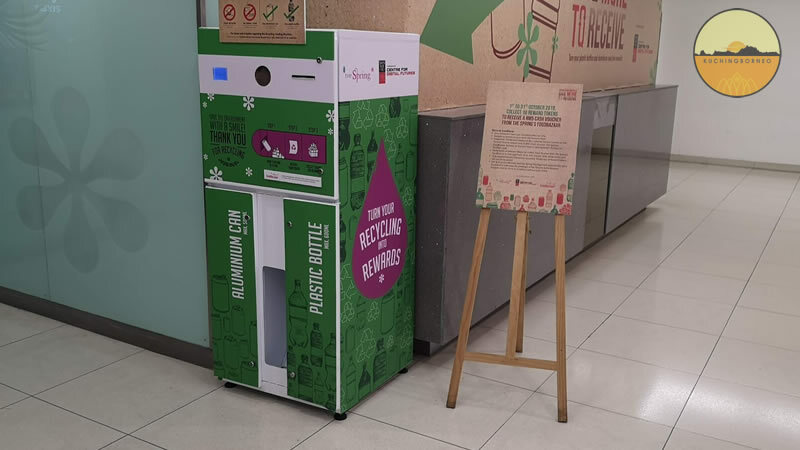 If you check out the machine however, you’d realize that it is a recycling machine and that every bottle or can you recycle would give you one token. Ten of such tokens can be exchanged for a cash voucher, which is technically you getting paid. Note: It only collects cans and bottles, so if you have a bunch load of newspapers, that doesn’t work. The method of use is simple. Just follow the instructions below. 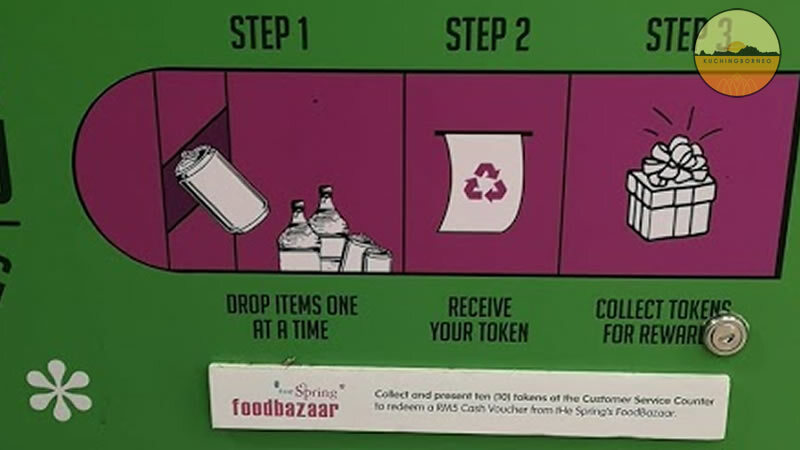 Before you hurry to tHe Spring Mall to send off your recycling items there’s some important things to note. Numero uno is that the RM5 cash vouchers would only be valid during the month of October 2018, and it is while stocks last. Other important terms can be seen below. 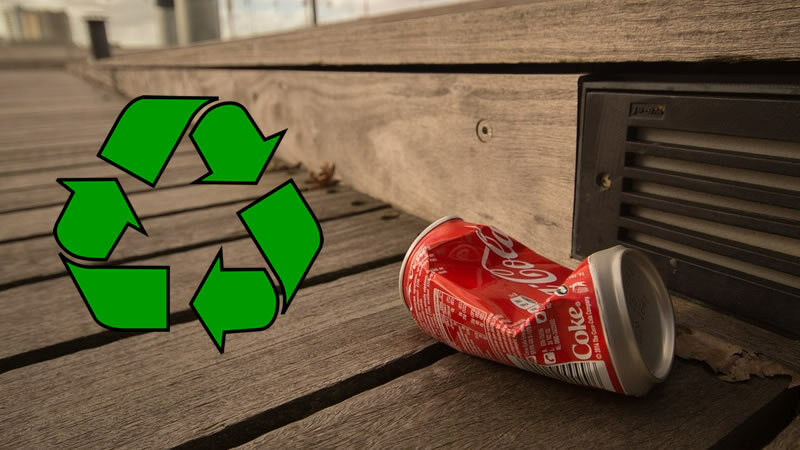 SHOULD YOU RISK IT – RECYCLING? I don’t know you, but I feel the cash voucher is just an added advantage to the act of recycling. Kuching is our home, and we need to maintain it. Recycling helps. If you collected ten tokens and end up not getting the RM5 voucher, don’t fret. Just smile and know you have done your part to clean up Kuching and the world. If you did get the voucher, then you can start thinking of what to eat at one of Kuching’s best shopping mall food courts. Remember, you are far a better person than those who chose to spoil our beautiful home by throwing garbage into our rivers.